"It doesn't matter if you want to quit. You started this, and you need to finish out the year." Arguing with mom about activities I had joined and then decided I wanted nothing to do with mid-year was pointless. If I made the decision to participate in the first place, it was a requirement to complete said activity, at the very least until the end of the year. A testament to good parenting. "I just really don't feel like it. I don't know that I will do an adequate job, I'm busy at home, and somebody else will always volunteer." The thought of commitment oftentimes incites the aforementioned emotions. 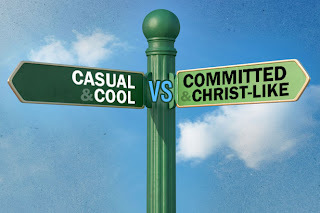 Is it popular to be committed? From what I see in pop-culture I would say no. The emphasis on promiscuity, making money fast, losing weight with diet pills and or shakes, getting anything and everything the quick and easy way - the bigger and better way. The significance of working hard and staying the course hasn't been lost, but in some circles it's become grainy. I'll be the first to say that I have a hard time making commitments. I'll take it one step further. It's because I'm selfish. I don't want to sacrifice the time I spend doing the things I love and enjoy. In my heart I desire to help and contribute to the people and activities surrounding me. In my mind I want to do what I want to do when, I want to do it. It's egoism plain and simple. It's hard to break out of my comfort zone. It's, uncomfortable. It's like trying to put on your pre-pregnancy jeans the day after you have a baby. Ugh! They don't fit and it's discouraging. That is exactly how starting a commitment can feel - like it doesn't fit and you'd rather be doing anything else. Have you ever heard of or witnessed a commitment that has moved you? Really moved you? Abraham - granted a son, willing to offer him up as a sacrifice to the Lord. People willing to go to jail or even die for their religion. Marriages that stand the test of time in love and length. Heroes and Heroins in stories wouldn't really make as much of an impression on us if they weren't committed to their cause. Take William Wallace in Braveheart. Commitment is admirable. Quitting, or in some cases never trying is... not. In some cases we are being shown that commitment isn't consequential though. We are subliminally being shown that breaking commitments or never starting them in the first place is better. If it doesn't "feel" good, then we shouldn't have to do it. In most cases (I will not say all) if you make a commitment to something or someone - even if it's awkward or difficult at times resolving to press on despite bumps in the road and pre-pregnancy jean moments the end result is more than worth it. It may be a relief to quit when the going gets tough, but you'll never know how things would have turned out had you stuck to your guns. My husband and I have been discussing commitments. Specifically commitments to God and what He desires for us. It is really nerve wracking. I get phobic thinking about it sometimes - I won't lie! I am initially gung-ho (insert man voice) "Let's do this thing!" when we discuss certain things, but then when the reality starts to set in and I think about all the possible issues that could arise I get nervous and start to back track. It is a huge weakness I have. Most of it stems from fear on my part. I know that God does not grant us a spirit of fear though. Living a life full of commitment is what I deeply desire for my family and myself and I believe what God also desires for us. I know that regardless of initial feelings of discomfort that the best thing for my family and for me is to live a life that focuses on commitment or as I would rather say, promise.